She-Hulk started life in the 1980s with her own book and she closed the decade a solo star as well. 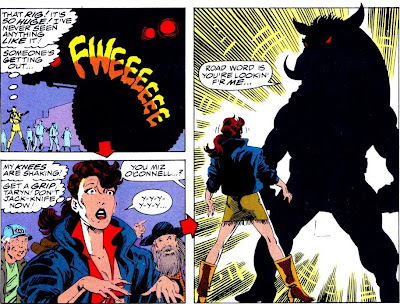 In the fifth part of Jade Jaunting, the year is 1989 and John Byrne is about to turn Shulkie sensational by breaking all the rules. In May of 1989, Sensational She-Hulk #1 hit the stands, a new ongoing monthly She-Hulk solo title that sported this modern classic of a cover. Newly returned to Marvel after a stint at DC where he spearheaded the reinvention of Superman, artist John Byrne was asked by the late great Mark Gruenwald to come up with a new take on She-Hulk. 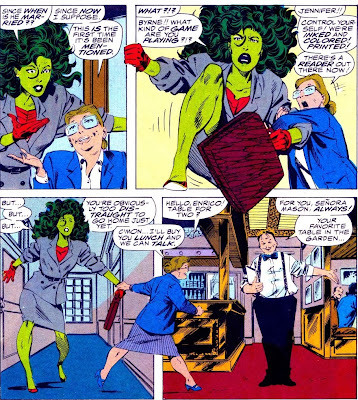 As Byrne told Jon B. Cooke in Modern Masters Volume Seven, his hook for the book would be the running gag that She-Hulk was aware she was in a comic book, continuously breaking the proverbial fourth wall in the process. 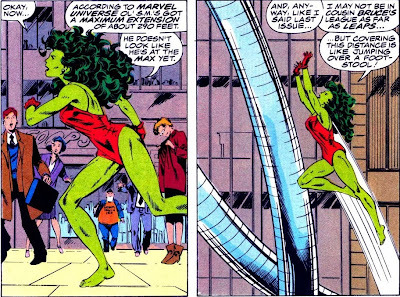 Incidentally, this 'fourth wall breaking' doesn't mean Shulkie spent most ot of her time demolishing walls. It's actually a theatre term originating in ancient Greece, where actors openly acknowledged the crowd, regularly sharing private thoughts or insights the other cast members were apparently oblivous to. 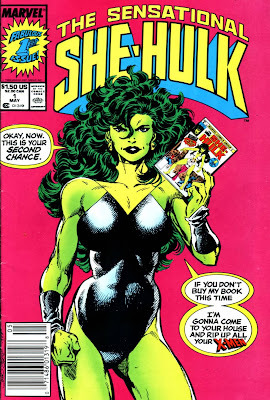 She-Hulk pretty much did the same thing, starting on the cover when she openly threatened the fans to buy her book... or else. Gruenwald figured the idea had great comedic potential, but Byrne was quick to stress he didn't write it as a humor book. "I didn't really think of it like that. That was part of the trick, I think. I didn't set out to be funny ha-ha, I set out to be weird and strange and wonky and try to keep it light-hearted. 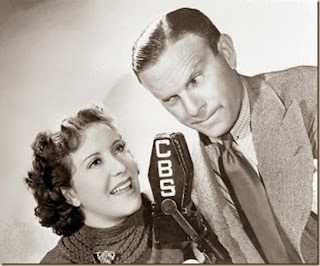 And that, of course, manifested itself as my own twisted sense of humor." While the book didn't intentionally set out to be Justice League level 'bwa-ha-ha' funny, Byrne did use She-Hulk's newfound awareness to poke fun at the conventions of the genre. That makes summarizing her stories a little difficult, however. 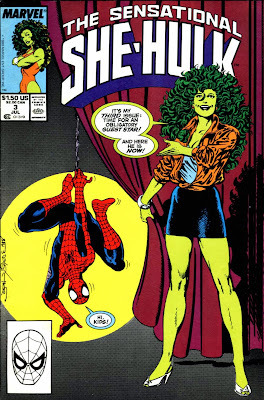 Usually, yours truly would spend an absurd amount of time detailling the myriad intricacies of the storylines, but to be perfectly frank: Byrne's Sensational She-Hulk was lovingly light on plot and just seemed out to have a good time, goofing off along the way. 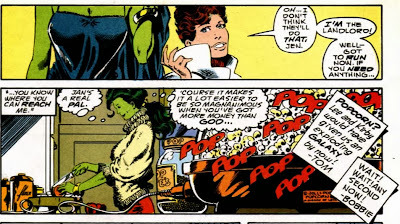 For instance, issue #2 opened with six pages of the Wasp giving She-Hulk a tour of one of her appartments she wanted Jennifer to move in to. 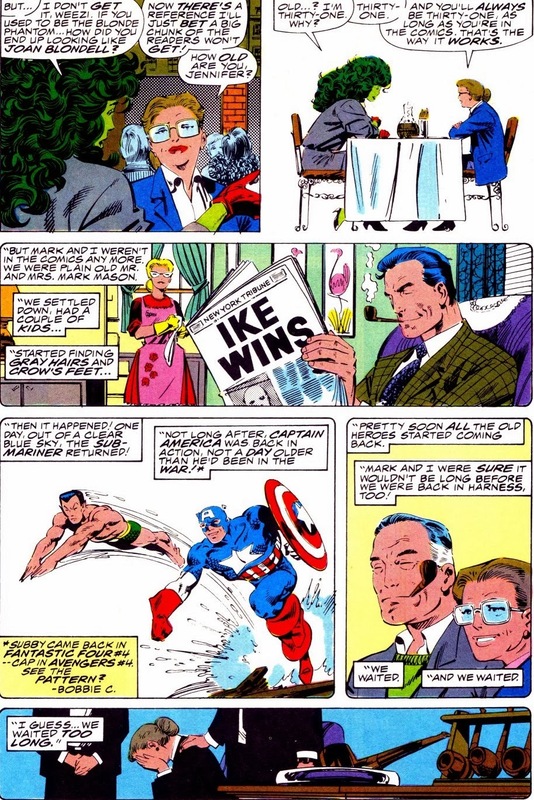 This continued a long running thread from Shulkie's time on Roger Stern's Avengers, when she was also trying to get settled in the Big Apple. Still, Byrne didn't break with all the established traditions regarding She-Hulk. For instance: she still had lousy luck with villains. As a member of the Fantastic Four and the Avengers, she had faced some of the biggest baddies the Marvel universe had to offer...however, as soon as she went solo, the evildoers she oppossed seemed to stem from the shallowest part of the villainy pool. For instance, the villain to beat in her premiere issue was the Ringmaster, who mind controlled her and forced her to join his Circus of Crime... The hypnotic carnival barker had the dazed Shulkie dressed up as Glamazonia the strong lady who robbed the audience by picking up the stands and shaking it until their wallets and jewels fell out... Talk about pitiable petty theft. "I was all set for the Kree or the Skrulls... or even the crummy Kryloreans..."
"Oh, don't worry about. It's just a setup for next issue." 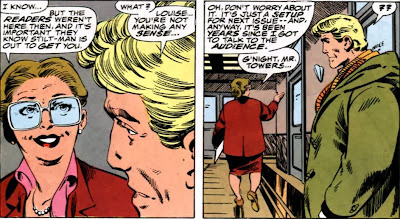 "It's my third issue: time for an obligatory guest star!" 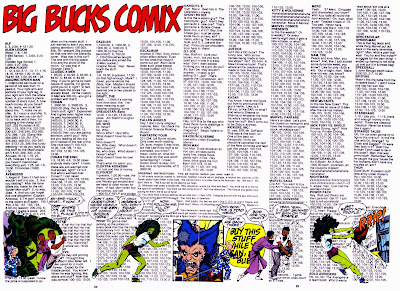 So this probably isn't much later than the morning after last issue"
Observant readers by then noticed that while She-Hulk got the crummiest baddies, her series seemed to follow the established pattern of Marvel's more succesful series. 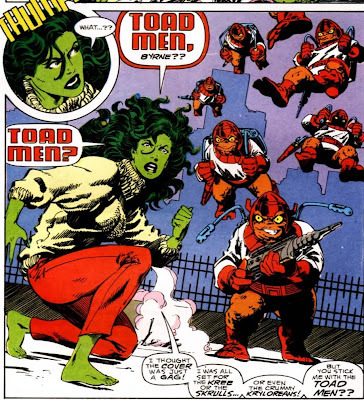 For instance, in Avengers I#1, the Hulk was dressed up as a clown in a circus...Issue two of the green giant's own book featured the Toad Men, who also showed up for Shulkie's second and the Avengers book had Namor the Sub-Mariner show up as a popular guest star in issue #3. "Byrne! What kind of game are you playing?!?" Yup, the tiny, frumpy assistant to D.A. Towers that Byrne had paraded around since the start of the title was actually Louise Mason, better known in the 1940s as the Blonde Phantom. After several decades of not appearing in any current comics, Louise noticed she started ageing. Once she lost her husband, famed Golden Age detective Mark Mason, to old age she figured she needed to get into a comic again to prevent a similar fate. 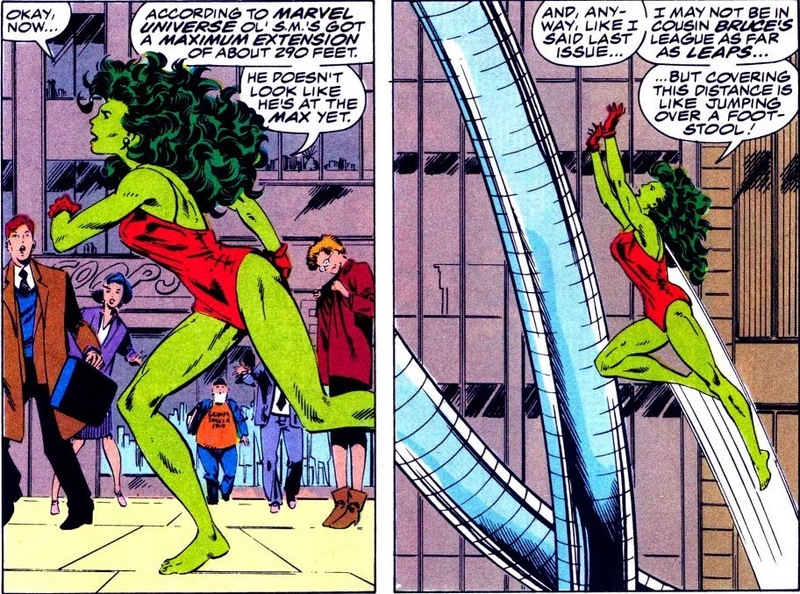 That's why she lobbied her boss to give She-Hulk a job, hoping to land herself a supporting role on Sensational She-Hulk, which would also prove her ticket to immortality. 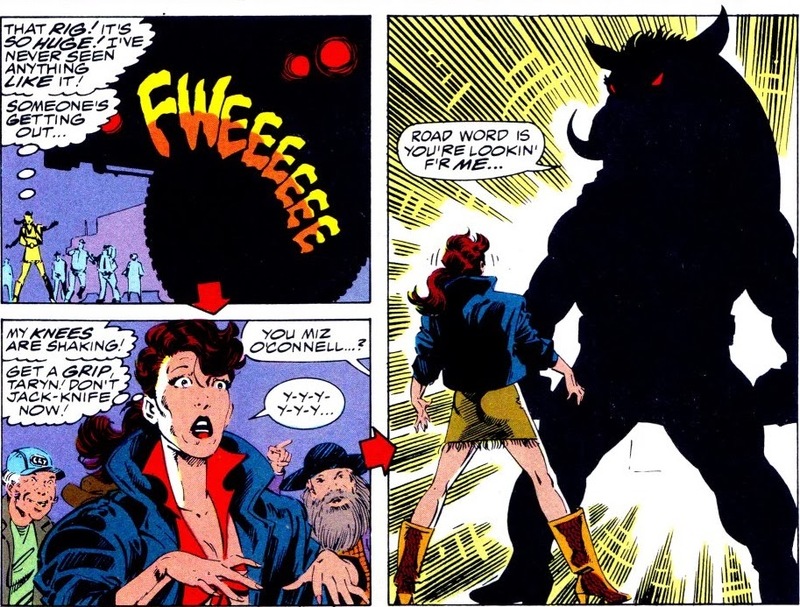 A startled Shulkie agreed, but got distracted when the issue's villain, the appropriately lame Stilt-Man, made his move against Jennifer's future boss D.A. Towers. 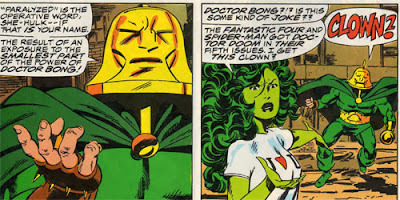 Of course, Byrne relied on some more tongue in cheek fourth wall breaking antics to liven up the inevitable fight. Ol' S.M's got a maximum extension of about 290 feet." 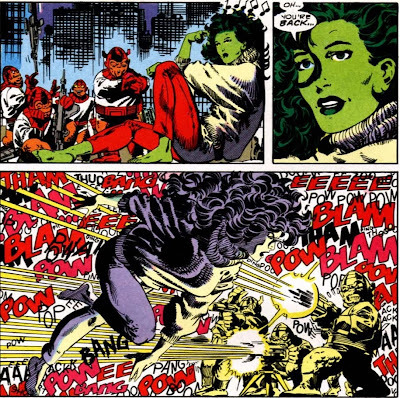 Ignoring the lady in the background who looks like she's enjoying whatever nature or her plastic surgeon gave her... She-Hulk used the 80s guide to all things geek, the Official Handbook Of The Marvel Universe, to beat a villain... by simply looking up his stats. In the end, Stiltman was defeated by Louise who had the chef of the bistro pour his cooking oil over the sidewalk, causing the villain to slip and fall. Ironically while fighting the one superhero who was also a laywer. 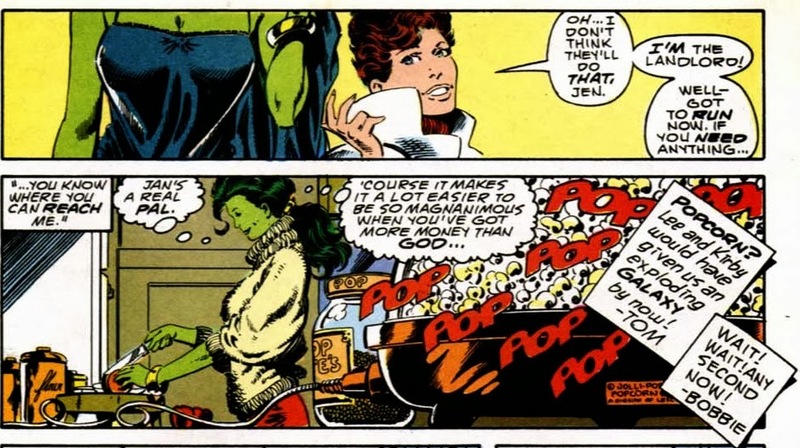 In the aftermath (and the closing pages of #4), Shulkie and Weezi got even more meta when they discussed just who the villain for issue #5 might be. "Doctor Bong?! Is this some kind of joke??" 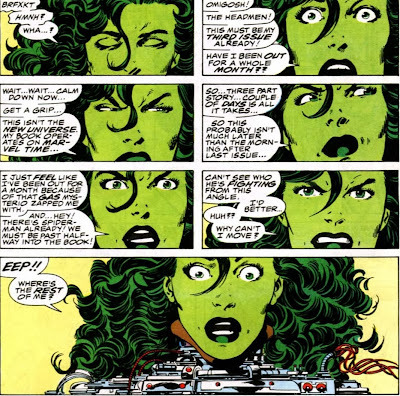 In order to escape, She-Hulk had to resort to the ultimate in fourth wall breaking: ripping her way through the pages and using the ads to get to safety. 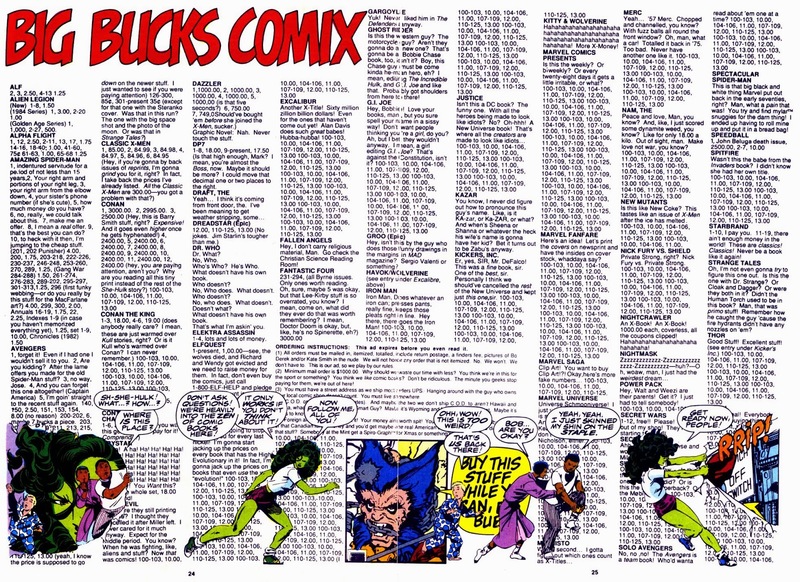 Remember when comic book stores used to run ads that listed what back issues they had in stock? Here's Byrne's take on it and be sure to read the copy, it's full of vitriol against anything X-related, while also correctly predicting the 'comics as investment' craze of the early 1990s. "Road word is you're lookin' f'r me..."
Absolutely loved this series while Byrne was on it. If only someone could actually pull of something like this as well as he did, I think there's a lot of potential in a fun, humorous superhero series that regularly breaks the 4th wall. This is all new to me. Good lord, they had fun! Thanks for sharing this!